Um. Here’s a lil clip Gadora took while in the process of applying the “crackle” paint. It was late summer then and Texas’ unyielding heat put a slight damper on the progress. 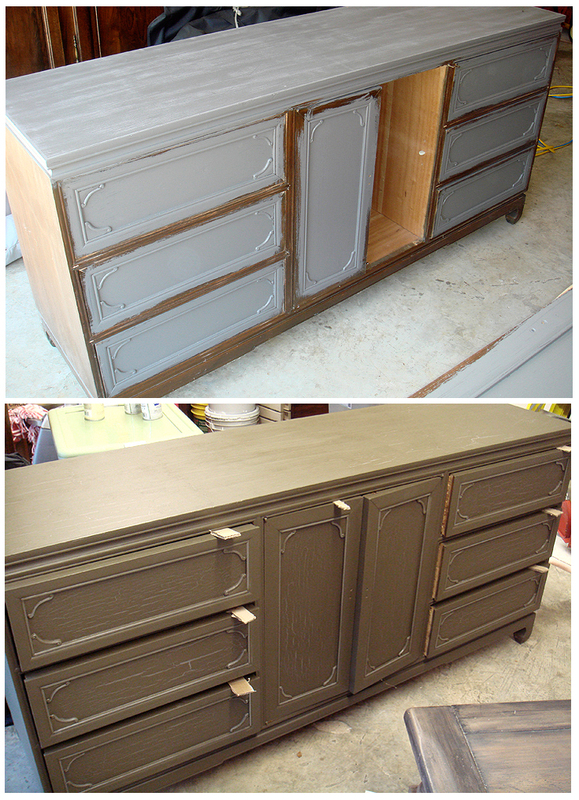 Below (top); dresser at mid-way point with drawers painted, sanded, gray undercoat applied, re-sanded with a finer grain, “crackle” medium applied to top and drawer fronts. Doors were removed to paint and outfit with new handles. 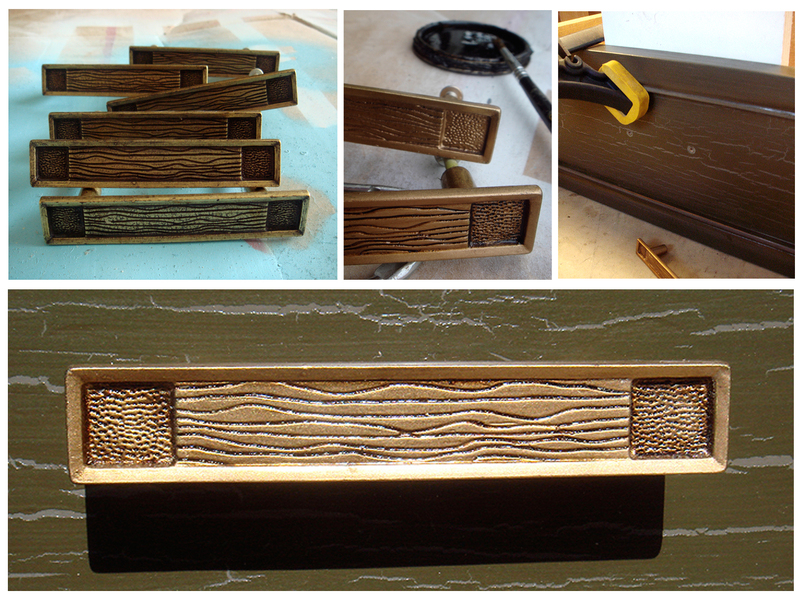 Below (bottom); olive top coat applied, allowed to dry, drawers put back into place, and awaiting top polyurethane seal. Cardboard slips assured the drawers would not stick. Dresser - on its way. A close-up of top surface with crackle paint, olive top-coat and poly seal. Before the poly coat could dry, Gadora wiped a damp cloth on surface to subdue the shine. The result is a subtle shimmer with a rich finish. Bottom (right); a close-up of corner detail. Once color coats dried, a sanding sponge’s marks draw attention to the architectural detailing of the piece. (Click on any image to view larger). An afternoon helping a friend dismantle her kitchen yielded an opportunity to re-purpose vintage handles. First cleaned with rubbing alcohol, they were sprayed with a shimmering copper paint. Once dry, Gadora brushed a dark stain on each handle then rubbed off leaving stain deep in the handle’s crevices. Love! Because these handles were sized differently than the originals, Gadora secured particle board behind every drawer-front before drilling new holes. Hadn’t mentioned the mirror! Here it is. 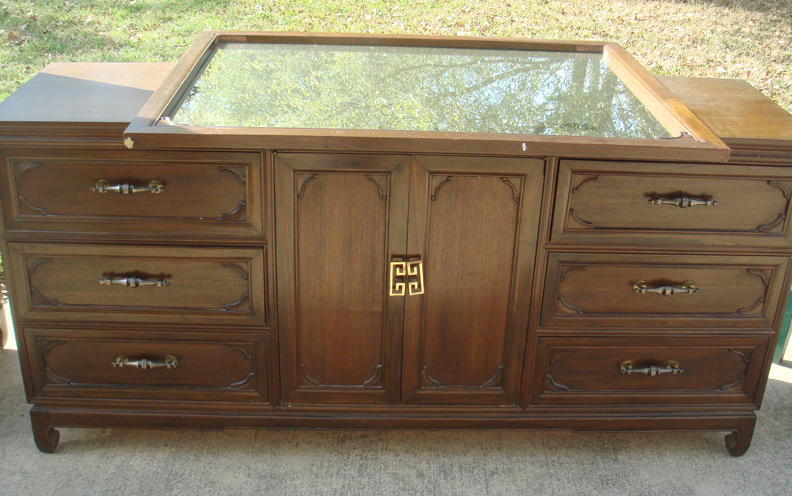 Treated without the “crackle” finish, the mirror can stand alone should this dresser be re-purposed as a credenza, or TV/entertainment center. 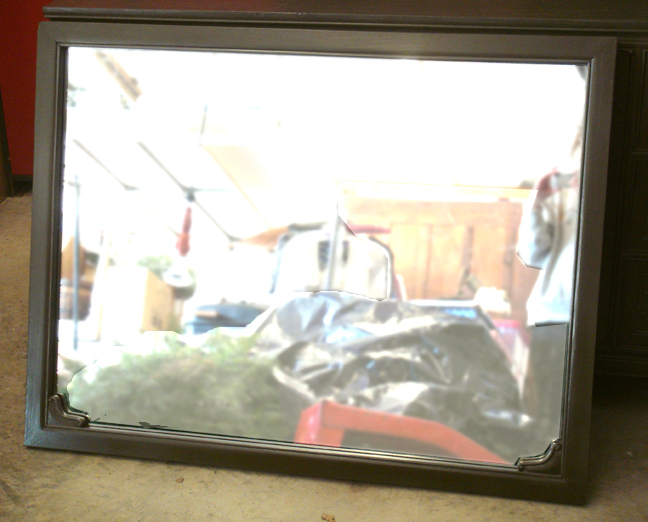 The HEAVY wood-backed mirror coordinates perfectly. The credenza/dresser finished. Photographed in the garage (forgive me for not ‘staging’ it properly? ), the bright Texas sun reflects its slight shimmer. Up close the deep, rich olive-finish makes it quite a looker. 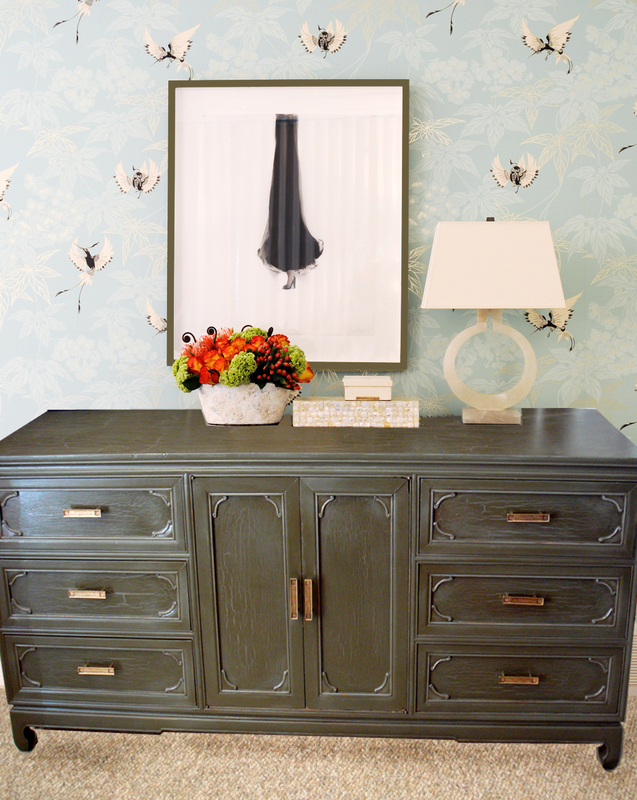 The piece could easily sit in a wallpapered hall dressed deliberately with personal effects (Thank you Corea Sotropa for providing the inspiration room), or nestled in a cozy master suite. 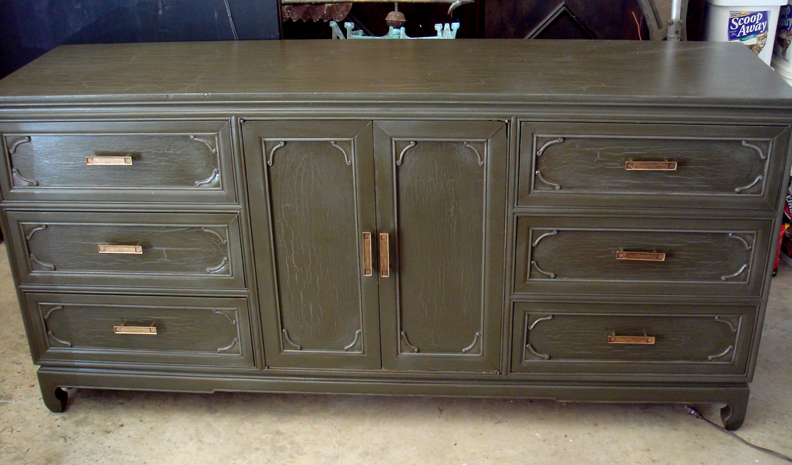 Posted on January 12, 2010 January 12, 2010 by gadorawilderPosted in BEFORE & AFTERTagged Architecture, dresser, Estate Sales, Lane Acclaim, mid-century modern, Shabby Chic, vintage. Next Next post: Gus and Codi sit pretty. Nice! Though I must admit I was expecting chartreuse!